A new economic analysis by Glassdoor’s Local Pay Reports says Philadelphia leads the nation in wage growth over the last year, printing around 2.8 percent growth since July 2017, bringing the median base salary to $55,723 per year. Glassdoor’s report is designed to provide a real-time overview of trends in median base salary for full-time U.S. workers in ten cities through an analysis of anonymous salary data from millions of employees. 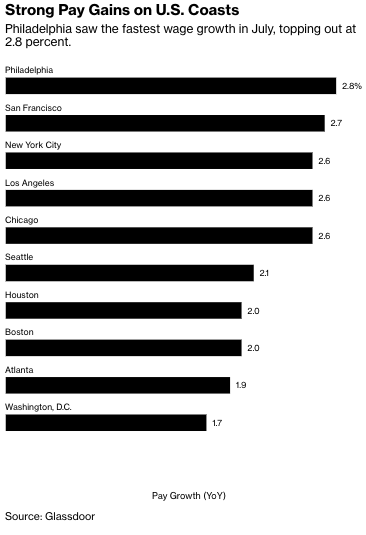 As noted by Bloomberg, San Francisco experienced 2.7 percent growth, New York City saw 2.6 percent growth and Los Angeles saw 2.6 percent growth, ranking as the cities with the next fastest pay increase. San Francisco had the highest median base pay at $69,404 per year, which printed at a $17,000 premium versus the national average. “Cost of living is certainly one factor that’s driving up wages for workers in these cities,” wrote Alison Sullivan, career trends analyst at Glassdoor, in an email to Bloomberg. The report, which examined wage growth among 84 jobs across 15 industries, discovered that certain professions were doing much better than others. Jobs in the financial sector experienced some of the fastest pay increases, according to the report, noting that bank tellers saw 8.2 percent growth in wages, while financial advisers and financial managers saw 4.9 percent and 4.7 percent growth, respectively. “Many of these bigger cities are also home to industries like tech, finance, and healthcare,” Sullivan said. In Philadelphia, most of the wage growth is driven by health-care and pharmaceutical companies that demand strong millennial talent from higher education institutions around the region. Bloomberg also noted that Washington, D.C., Atlanta and Boston observed the lowest annual pay increases in July, expanding by 1.7 percent, 1.9 percent, and 2 percent, respectively. The report can be misleading when placed in a broader context than the professions generally covered by Glassdoor, said PhillyVoice. The most recent data from the Federal Reserve revealed that Philadelphia’s median household income level was $41,449, which includes residences with more than one job — not just a single wage. Another shocking reality is that Philadelphia has the highest rate of deep poverty (an income of less than $10,000, or 50 percent of the federal poverty threshold) of any large city. 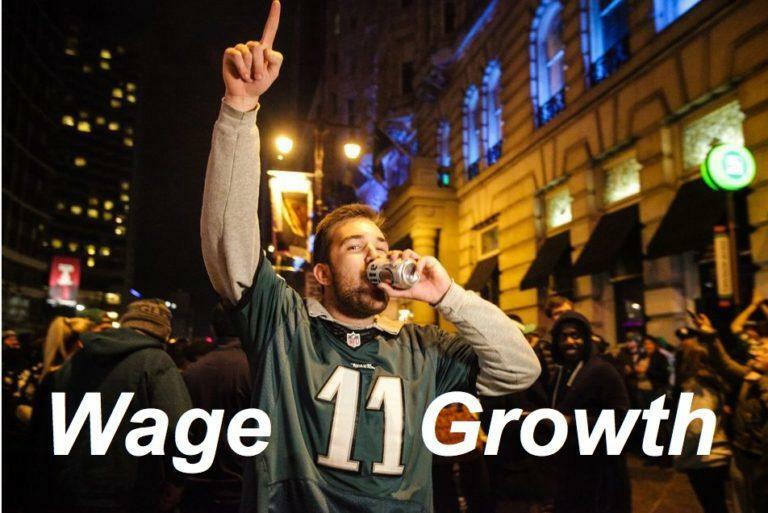 “The comparatively favorable cost of living in Philadelphia is in fact primarily offset for renters, who generally receive lower wages than those in other large U.S. cities. That challenge was highlighted in a recent collaboration between PropertyShark and RENTCafé, which found deficits in discretionary income for both homeowners and renters,” said PhillyVoice. Regardless of the different figures, “the steady uptick in Glassdoor’s data is generally a good sign for workers and evidence that today’s tight labor market may finally be translating into further base pay gains for U.S. workers into the remainder of 2018,” Sullivan concluded.